One particularly uninspiring grey November morning, I found myself en route to a secret location in London’s Russel Square to meet with Cecily Braden, educator and leader in the wellness industry and founder of Beautysecretsus.com. I was interested to hear her views on the Siam Botanicals skincare range, and why she felt they were the ideal accompaniment to her facial treatments. I was interested to learn more about Gua Sha, the traditional Chinese practice of using stone tools for facial massage (Vogue has plenty to say about this too). But to be completely honest, I was mainly interested in being a “model” – in the loosest possible sense of the word – as she demonstrated her renowned Gua Sha technique to 8 eager students using my own face as her teaching aid. It’s not often that one gets the chance to lie back and relax whilst Cecily Braden gets to work. However, I was slightly apprehensive when I saw the Gua Sha jade stone she was planning to use. It was, well, a stone. A stone with pointy bits that didn’t look particularly face-shaped. Was I going to have to practice my poker face whilst being subjected to some unpleasant kind of torture in the name of lymphatic drainage and qi flow? Of course I needn’t have worried. To start with, Cecily used a hot towel and Siam’s Rosehip and Tea Tree oil-based cleanser. Soothing and moisturising, this light cleanser gently and effectively removes makeup (which I wasn’t wearing) and city smog (which after a 6 mile cycle I definitely was). 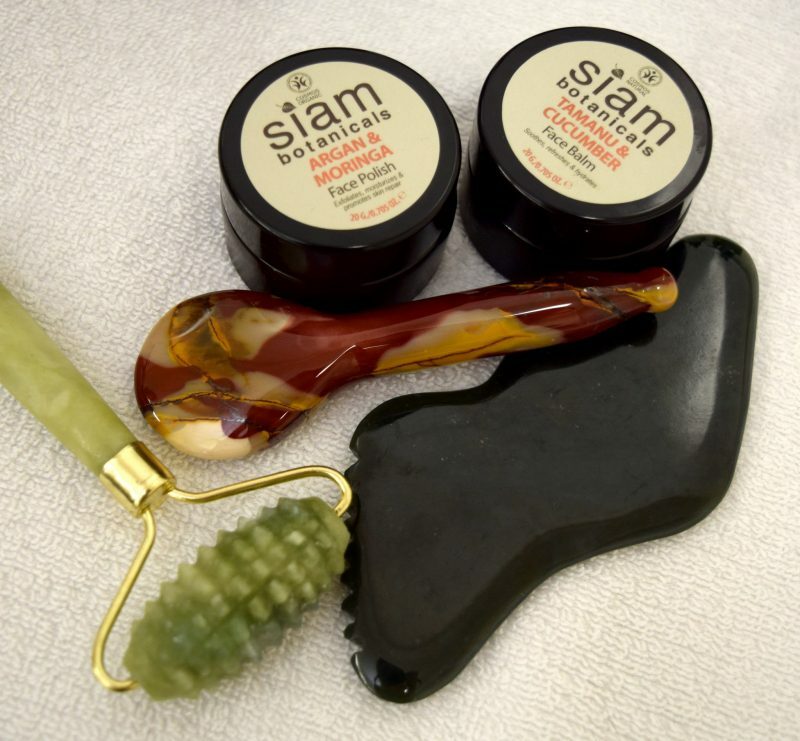 The next step was Siam Botanicals’ Argan and Moringa Facial polish aka an exfoliator that actively moisturises the skin. I could feel my pores positively singing as Cecily expertly wiped away the last few natural jojoba wax beads. Next on the list was a spritz of toner: pure Bulgarian Rosewater to be precise. Siam Botanicals uses only organic Bulgarian Damask roses to distil this purest of botanical extracts. Rosewater has been used traditionally for hundreds of years to gently tone and lift the skin, as well as reducing the appearance of dark circles. Also I can confirm that it smells incredible. Finally, Cecily used the Natural Balance Face Serum, full of light grapefruit and lavender oils to make it suitable for day and night use. Then, explaining her process to her students, Cecily reached for the Gua Sha stone and began her magic. Starting at my neck and clavicles, she proceeded to use her deep understanding of traditional Chinese medicine to clear my lymphatic pathways and stimulate the body’s own systems of energising and healing. She worked along my jaw, cheeks and the sides of my nose, easing tension and draining away areas of puffiness. She worked along my brow bones, massaging out adhesions and smoothing away my frown lines, and then up and along my forehead until my face was as smooth as a peach. 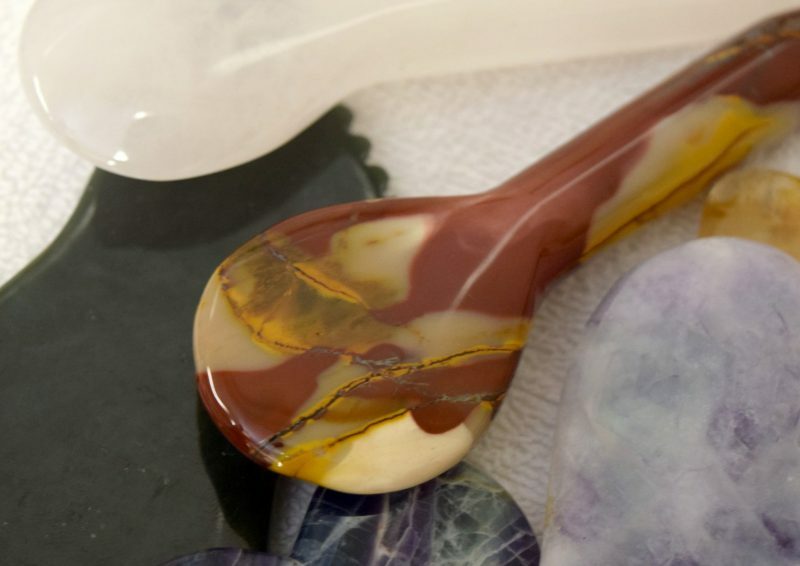 The Gua Sha stone was of course pointy in all the right places [picture of it fitting exactly around my ear] and used expertly to smooth, relax and energise it felt sometimes warm, sometimes cool, and always delicious against my skin. Unfortunately for me, the room full of students had been extremely attentive and did not need to see the demonstration a second time. After I’d reluctantly hopped down off the table and re-entered the real world, I couldn’t help but notice my skin had a healthy glow and my smile was wider than usual – all down to the Gua Sha stone and it’s expert wielder. Customers in the US can buy the products used in my facial rejuvination through the Beauty Secrets Website as well as finding out more about the treatments and education services Cecily’s company provides. Customers in the UK can go direct to our webshop or of course visit the new shop at 32 Cheshire Street in London. Customers in Thailand can visit our flagship store or order through the website here. This entry was posted by Darren in News.